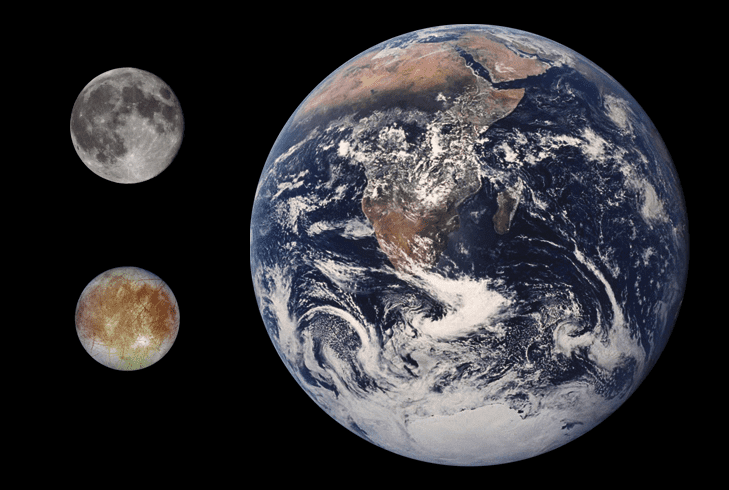 Europa, compared to Earth and the Moon. Europa is slightly smaller than the Earth’s moon, is primarily made of silicate rock and probably has an iron core. Its atmosphere is composed primarily of oxygen, while it’s surface is pretty much as smooth as it gets. It harbors a liquid ocean beneath its frozen surface and, at least according to some researchers, this is the most likely non-Earth place in our solar system to find life. It’s still not clear what the money will go into, but the mere fact that it will go into a “Europa mission“. Recently, Europa was in the spotlight again when Mike Brown, an astronomer at the California Institute of Technology in Pasadena uncovered the existence of magnesium sulfate salt on the surface of the moon. Through some careful, thorough chemistry detective work, he traced this presence back to cycling of Europa’s salty ocean with the surface [full story here]. This provides a tantalizing clue as the the cycling of nutrients through Europa’s crust, potentially supporting a sub-surface ecosystem. It’s obvious these issues have to be looked up from short range. Last year, NASA’s budget was hit by a 20 percent reduction in funding for the planetary sciences. Could this be the first sign of optimism in years?